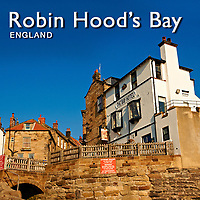 Pictures & Images of Robin Hood's Bay, North Yorkshire. Robin Hood's Bay is a small fishing village on the North Yorkshire Coast whose houses tumble down the cliffs linked by a maize of small alleys. This picturesque village is famous for its tales of smuggling and the close proximity of the houses and their underground cellars led to the stories that smugglers could land their tea, brandy tobacco or gin on the beach then move the contraband up through the cellars of the houses to the top of the village without the Excise Officers ever knowing. Robin Hood's Bay was settled by Danish Vikings in about 1000. After the conquest of William The Conqueror in 1066 the area was given to Tancred the Fleming who sold it to the Abbot of Whitby. The people of the Bay relied upon fishing and farming using as style of boat known as the Coble to catch herring which were then sent over the Moors to York. Today few fishermen work from the little harbour of Robing Hood's Bay and the village relies upon tourism. Apart from the picturesque village visitors come to Robin Hood's Bay to look for fossils in the layer of Jurassic shales that lies along the beach. The whole of the East coast of England is slowly sinking into the sea and the coast is getting heavily eroded. To save Robin Hood's Bay high sea walls have been built to protect the village.